Volkswagen is set to reveal a new small crossover to take on the likes of the Nissan Juke and SEAT Arona. The T-Cross is expected to appear at the 2018 Paris Motor Show, but Volkswagen's released a design sketch ahead of its official debut. Volkswagen's keeping quiet about further details including prices, but expect it to start slightly below £18,000 - more than in-house rival the SEAT Arona. Unsurprisingly, the car maker's hinted that the T-Cross will major on practicality and safety - with a number of driver assistance systems as standard. It'll be based on the same MQB platform as other VW Group products, with dimensions close to the latest Polo and smaller than the Volkswagen T-Roc. It's likely to share the same petrol and diesel engines with the rest of the range, while the platform can also cope with hybrid and electric architecture. While buyers are likely to be given the choice of five- and six-speed manual gearboxes as well as an automatic, the firm's unlikely to offer a four-wheel-drive version due to low demand from crossover buyers. 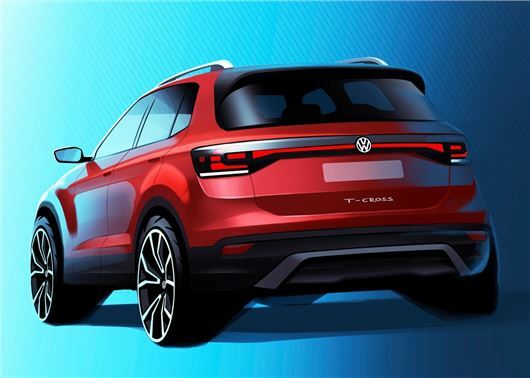 Although Volkswagen Group cars have a tendency to follow a similar design trend, the early design sketch of the T-Cross suggests it might look slightly different to models such as the T-Cross. Indeed, its full-width rear light cluster will be unique if it does make production. The T-Cross is the latest vehicle in Volkswagen's SUV drive, which also features the T-Roc, Tiguan, Tiguan Allspace and Touareg.